Two Sides to the Story: Who is The Goddess of Time? 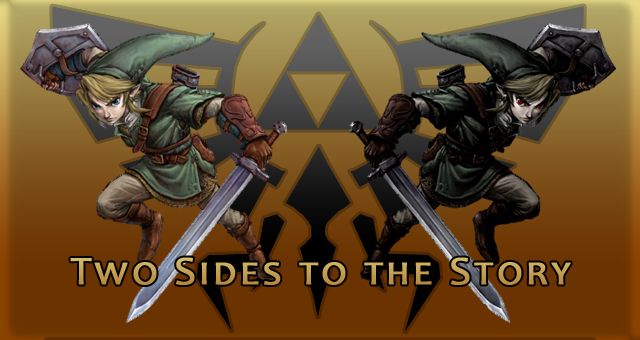 Welcome to the newest article series at Zelda Informer: Two Sides to the Story. Longtime followers of our website may remember the Bombers Debates of old, in which several of our staff, and sometimes guests from other websites, would debate a hot topic in theorizing. Consider that series as the building blocks for this new series, in which we take a controversial topic, and explore two possible theories about it. Instead of the back and forth discussion style of the Bombers Debates, Two Sides to the Story gives you two articles in one. Two different members of Zelda Informer with opposing, but equally supported, viewpoints on a subject each put their thoughts into a mini-article, and the two are then combined into one article for your viewing pleasure. We present the facts, and you, the readers, can do the debating for yourselves. For our first ever entry into the Two Sides to the Story series, Ben Lamoreux and Dathen Boccabella explore the question: Who is the Goddess of Time spoken of in Majora’s Mask? There are many theories about this, but for the purpose of the article series, we’ve narrowed it down to the two candidates that we find to be the most likely: Nayru and Farore. Read on for the Two Sides to the Story, and you be the judge. The notion for Nayru being the Goddess of Time extends right back to Majora’s Mask, and for many people, she is the first candidate that comes to mind. The theory for Nayru can be said to be the original Goddess of Time theory, with the supporting evidence ranging from very strong references, to more obscure connections. Although Majora’s Mask is the game where the identity of the Goddess of Time comes into question, it is chiefly from Ocarina of Time that the case for Nayru can be built, with Oracle of Ages adding some important details. Ocarina of Time was the game where we really got to know the three Golden Goddesses, despite their first appearance being in A Link to the Past. The Great Deku Tree tells the story of Hyrule’s creation, detailing the role each Goddess took in the process. Din created the “red earth itself”; Farore “produced all life forms”; and Nayru, she gave the “spirit of law to the world”. Of course that doesn’t mean laws like ‘thou shall not steal’ and ‘thou shall not murder’, it refers to the operation and functionality of the world. To ‘laws’ like gravity, and of course, time. This is the crowning piece of evidence for Nayru’s case, because as is evident in the Deku Tree’s story, time logically falls into the category of law – not life or earth. From this cornerstone of the Nayru argument, more can be raised in support of Nayru as the Goddess of Time. Princess Zelda’s role in Ocarina of Time is one such point. As we know, Zelda is the bearer of the Triforce of Wisdom, which corresponds with the Goddess Nayru. Zelda possesses a portion of Nayru’s power, and as the game goes on to reveal, Zelda has power over time as the Sage of Time. 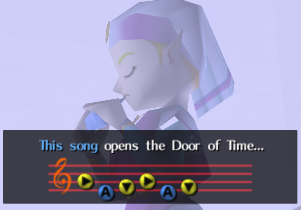 At the conclusion of Ocarina of Time, it is Zelda who sends Link back in time using the Ocarina of Time. Notably, it is Zelda who the titular Ocarina actually belongs to, with Link just borrowing it for a period. During his possession of the Ocarina, Link comes to be known as the Hero of Time. Now while that is a supporting argument for Farore as the Goddess of Time, due to Link’s possession of Farore’s Triforce of Courage, it can also become a part of Nayru’s argument. 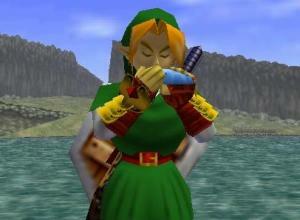 Link’s role as the Hero of Time is entirely due to Zelda’s interaction with him and, by extension, his possession of the Ocarina. His role as the hero is due to a connection with Zelda – who is the Sage of Time and has a connection to Nayru through possession of the Triforce of Wisdom. It is as if Zelda is personally promising Link that she will ensure the Goddess of Time will watch over him. Or, in the least, that his possession of the Ocarina and Song of Time ensures his protection. It is logical to assume that Farore would be naturally bound to the Hero due to his possession of the Triforce of Courage, so then it seems like the Goddess of Time is someone other than Farore. 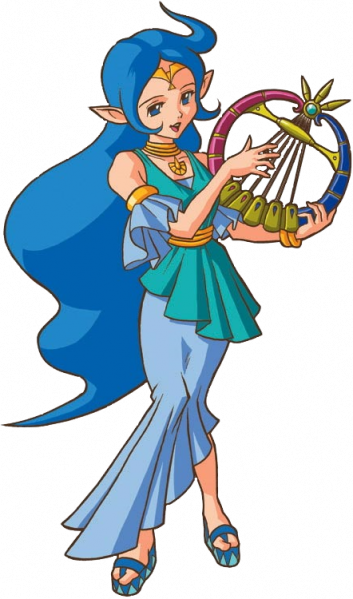 Nayru is the Goddess that Zelda has a connection to through her possession of the Triforce of Wisdom. For her to be so knowledgeable of The Goddess of Time and to be able to promise her divine protection, it is logical to connect the dots and theorize that Nayru is the deity watching over time. However, there is much more to both sides of the argument for us to draw a conclusion just by connecting those dots. Obviously the role of Zelda is not as much of a piece of convincing evidence as the creation story, but it does nicely further the argument. The Legend of Zelda is a series where things are done for a reason, and due to that, everything no matter how major or minor needs to be put on the table. What may seem to be nothing can actually be very significant. With that said, the next piece in support of Nayru as the Goddess of Time is simply the color blue. Many are quick to dismiss this as ‘clutching at straws’, which it would be if it were alone. Thankfully there is already a strong case for Nayru, so the usage of the color blue can be raised for assessment. Predominantly, blue is the color used to represent Nayru, however it is also used in all instances of time travel throughout Ocarina of Time. 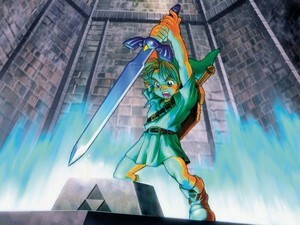 Pulling the Master Sword results in Link being surrounded by swirls of blue; playing the Song of Time results in a blue background on the screen; and Zelda sending Link back in time seven years causes Link to be surrounded in a blue ring – similar to those seen in boss rooms after the completion of each dungeon. The color blue is very intentionally used to portray time travel. We can relate blue to Nayru, but also to water. This ties in neatly to Sheik’s reference to time travel as flowing up and down time’s river. Ultimately, whether the usage of blue has any relevance to this debate is up to the individual – just like the whole Goddess of Time debate is. Lastly, it is time to move away from Ocarina of Time and jump to Oracle of Ages for the Game Boy Color. Oracle of Ages uses time travel fundamentally in the game, with Link harnessing the power of the Harp of Ages to travel back and forth through time. The relevant point to this debate is that the Oracle of Ages is named Nayru. 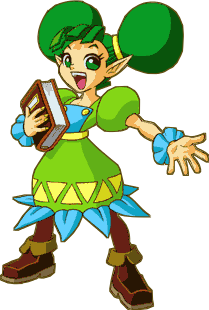 Din is revealed as the Oracle of Seasons in that very game, and through Linking both games, Farore is dubbed the Oracle of Secrets. With ‘ages’ serving as a synonym for ‘time’, and the more obvious mechanic of time travel being featured all throughout the game, Nayru presents a much stronger case than the other Goddesses in this instance. People familiar with the development of the Oracle games will be aware that the games were originally intended as a trilogy, with Farore serving as the Oracle in the time based game. Due to development constraints this isn’t the way the final games turned out, which leaves us with a conflicting issue: is developer intent or in-game canon of more relevance? Of course, those of us who stick to the hard facts provided by the games themselves will support Nayru’s connection to time in this instance. 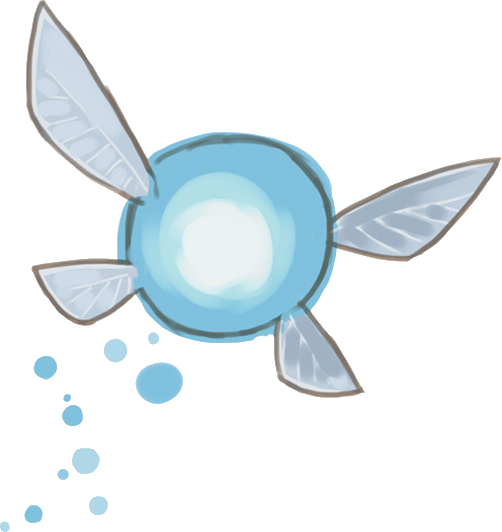 In Oracle of Ages, the Oracle Nayru features prominently in the presence of time travel, and in Ocarina of Time Nayru can be connected to instances of time travel through Zelda and usage of the color blue. As the Goddess of Wisdom who created the laws governing the world, time is fittingly a part of Nayru’s portfolio. It was this very point in the Deku Tree’s creation story that started the theory for Nayru as the Goddess of Time, with every other point serving as supporting evidence. In all, a strong case can be made for Nayru, but it is far from strong enough to be the definitive answer to the question of who is the Goddess of Time. Symbolism has played a large role in the Zelda series for over two decades, with many things representing something else. This is especially evident when the three Golden Goddesses of Hyrule are examined. Din, Nayru, and Farore, are each equated with a virtue. Power, Wisdom, and Courage respectively represent the trinity of Hylian deities. From there, these virtues are also equated with many other important people, places, and relics in Hyrule. Because so little is known about the Goddess of Time herself, in order to uncover her identity, we must dive into these symbolic representatives. There have been several incarnations of Link throughout the series, most of them bearing a specific title. The Link who adventured in both Ocarina of Time and Majora’s Mask is well known as the Hero of Time, with his exploits in the manipulation of time being passed on for hundreds of years. There may be no more well known physical manifestation of time in all of Zelda than the Hero of Time himself. Link, as the divinely chosen wielder of the Triforce of Courage, has clear ties to Farore. Each piece of the Triforce carries inside of it the very essence of a Goddess, and thus, Link essentially is the physical vessel for Farore’s essence. One of the few things that we know about the Goddess of Time is that she is responsible for the manipulation of time in Majora’s Mask, and as told to Link by Zelda in a flashback scene, she is protecting Link. As the carrier of Farore’s essence, it makes sense that Link would be under the watchful eye of Farore at all times. Farore has a much greater reason to safeguard Link than any other deity would. Oracle of Seasons and Oracle of Ages, the connectible Zelda titles for the Game Boy Color, give us another example of the Goddesses being represented by a lesser being. These two games feature three prominent female characters each named after one of the Goddesses. Din, Nayru, and Farore are each spiritual leaders in the lands of Holodrum and Labrynna. Anyone who has done some research into the history of the Oracle series knows that these games underwent some massive changes from their conception to their release. Originally the Oracles were planned as a trilogy, with Capcom also making remakes of the two classic NES Zelda titles. The remakes were soon scrapped, and instead it was decided to simply incorporate ideas from the first two Zeldas into the first two games of the Oracle Trilogy. From here the plan became that one Oracle game would feature season-based puzzles and elements of Legend of Zelda, with Din playing a prominent role in the plot. The second game would feature color-based puzzles and elements of Adventure of Link, with Nayru being the featured Oracle. Finally, a third, completely original game featuring time travel and the resurrection of Ganon would star Farore as its Oracle. Because of time restraints and connectivity issues, the third game had to be scrapped. The result of this being that, while Oracle of Seasons remained largely unchanged from the plan for the first game, Oracle of Ages combined both the color and time elements of the second and third games into one. With Farore’s game being scrapped, she was reduced to a much smaller role in the Oracle games, and the plot of Ganon’s resurrection was turned into the linked ending of the games. Because of this, many now associate the Oracle Nayru with time, as opposed to the Oracle Farore having that connection. This change of plans was not for plot reasons though, but connectivity issues. The plan had always been for Farore to be the Oracle of Time, but unfortunately the complex development process of the series didn’t allow it to stay that way. Phantom Hourglass is the most recent Zelda title to offer a hint to the identity of the Goddess of Time. Like in the Oracles, the Goddesses are represented by three lesser spiritual beings. This time we are introduced to three fairy Spirits: Leaf, the Spirit of Power, Neri, the Spirit of Wisdom, and Ciela, the Spirit of Courage. Link meets the first two spirits by rescuing them from dungeons, but Ciela is his companion from the game’s beginning. Having lost her memory when she split her soul to escape imprisonment, Ciela is unaware of who she is. When Link reunites Ciela with her imprisoned soul, she regains her memory, and awakens as the Spirit of Time and Courage. Unlike the other two, Ciela has a second title assigned to her: Time. In the fight against Bellum, Ciela displays this by freezing time in place, allowing Link to attack Bellum’s weak spot. From the first mention of the Goddess of Time, Farore’s connection to the Hero of Time coincides with what little we know of the Goddess of Time. The issue with exactly which Oracle is supposed to be most closely associated with time is unfortunately a mess due to all the development upheavels, but Phantom Hourglass, the most recent evidence we have about the subject, seems to solidify Farore as the one Nintendo intended the Goddess of Time to be. Farore or Nayru? Who is the Goddess of Time? Both sides of the argument present a compelling case, but neither definitively stands out as the answer. It comes down to your own interpretation, not just of who the Goddess of Time is, but how you interpret the evidence. In cases such as the Hero of Time and the Oracles, arguments can be made for both Nayru and Farore, and it comes down to your own personal choice of which side the evidence supports. Maybe a future installment to the Zelda series will shed some more light on the scenario, or even finally provide us with the answer. Until then, we’re left to piece together what evidence we do have and accept that there are two sides to this story. That doesn’t stop us from choosing our own side though. So, which side are you on?